Ermal Hoxha is released. 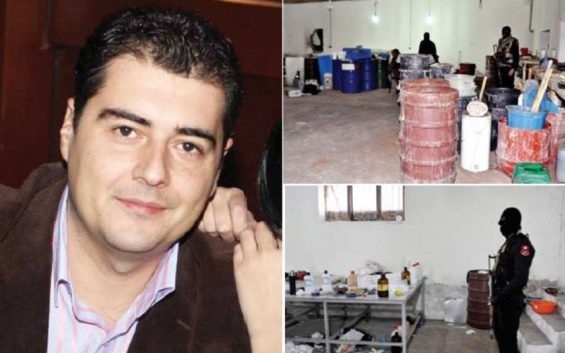 The grandson of the former dictator Enver Hoxha convicted of drug trafficking after the discovery of the cocaine lab in Xibraka has been released on parole. Hoxha will not suffer 1 year and 6 months imprisonment but he was granted bail. Former dictator's grandson left the Fier prison cells on September 13. Ermal Hoxha was arrested during the operation at Xibrakë and was sentenced to 6 years and 8 months in prison for drug trafficking in tentative. A sophisticated cocaine processing laboratory was discovered at Xibrakë on January 14, 2015 and the news made rage at that time. This was one of the most important operations carried out by police in recent years. According to the information from the investigation, the arrested Ilir Hyseni was the main character covering the drug-taking abroad and her behavior in Albania. He was the one who oversaw its passage to European countries, mainly in Germany. According to the investigation, Ermal Hoxha had the role of financier. He was the person who covered the drug liquidation when entered Albania and was receiving money from the recipients when cocaine was exported abroad. Enver Hoxha's grandson was arrested after being filmed by police agents in the drug lab at Xibrakë, Elbasan. Ermal Hoxha along with the eight defendants of the file, including two Colombian nationals, were found guilty of Serious Crimes and sentenced to 104 years in total. In November 2017, the Criminal Appeal reduced significantly the sentences imposed on them, after accepting the application of the shortened trial, reducing each defendant one third of the sentence. In April this year, the grandson of former dictator Enver Hoxha, sought innocent disclosure, making recourse to the decision of Serious Crimes Appeal to the Supreme Court.